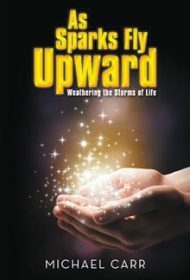 Semi-retired Christian minister Michael Carr’s As Sparks Fly Upward is an impressive, thoughtful, and poetic collection of writings, reflections, and sermons that should serve as a source of inspiration for readers who are experiencing strife and turmoil. Mixing memoir and theological ruminations, the author draws heartfelt lessons learned from his life of faith and severe personal challenges. Seven years into their marriage, Carr’s wife Patricia, then 31, was diagnosed with myasthenia, a rare autoimmune disease that leads to accelerated muscle atrophy. Patricia wasn’t supposed to live past 50, yet ended up living with this terrible condition for 47 years. Carr nursed his wife throughout those years, simultaneously dedicating his life to God and spending two hours in prayer every day. In time, he became a popular clergyman, built churches, and ministered to his flock. This mixture of blessing and burden is at the heart of the Christian faith—and Carr’s book. For every moment of suffering, he suggests, there’s a lesson to be found. Carr is skilled at illuminating these blessings through metaphor. Whether he’s relating our human frailty to the delicate shell of an egg, using the idea of a tattoo to discuss the eternal, or invoking the image of a WWII hero whose job was to find mines to help us understand the minefields of temptation, Carr has the soul of an artist. Like any great artist, his honesty can be raw. “Being a Christian is not the life of a sissy. All who profess [Jesus’] name will live through hazardous experiences that are the guarantee of discipleship.” These can be tough words to hear, yet, Carr, who has endured much in his 80-plus years, speaks as one who knows that truth ultimately leads to liberation. In sum, As Sparks Fly Upward, a multi-layered work of Christian inspiration as well as a love letter to a wife and God, is a strong and wise companion for those suffering through rough times. BlueInk Heads-up: The Star designation is given with the recognition that the text contains some typographical errors that remain in need of attention.